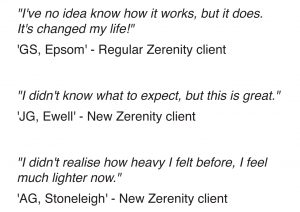 Welcome to Zerenity Reiki, based in Ewell, Surrey, UK. 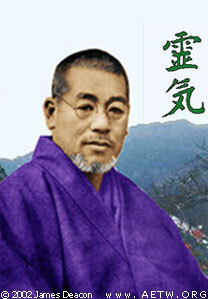 Reiki (pronounced ‘ray-key’) is a complementary therapy founded by Mikao Usui in Japan in the early part of the 20th century. Reiki is an ancient gentle and effective system of healing which uses the life force energy to heal and which activates the body’s own natural ability to heal itself. As a natural healing system, it can benefit everyone, from babies to adults, and is a safe, non-invasive treatment. It has gone through a self-regulation process and is approved by the Complementary and Natural Healthcare Council (CNHC). Treatments with Reiki energy help reduce stress within the body, thereby inducing a state of inner calm. The body can then be allowed to begin the healing process. It is an extremely relaxing experience and the benefits are immediate. All diseases and ailments can be helped with Reiki and it is safe to use in conjunction with other complementary therapies and conventional medical treatments. Reiki produces a feeling of total wellbeing and this has a very positive effect on the immune system. Although Reiki is spiritual in nature, it does not come from any particular religion, but more the universal energy that we are all, together, part of.Reiki is a combination of two Japanese words ‘rei’ and ‘ki’ meaning ‘universal life energy’. This universal energy is channelled through the practitioner to the recipient and works on all levels of the mind, body, emotion and spirit, promoting total harmony and balance to be restored. Reiki can also promote self development, therefore allowing you to be at your optimum to deal with all aspects of life. Practitioners have been attuned by a Reiki Master, to receive and pass on this energy to heal themselves and others. Contact me on 0774 33 88 393 or email me at kerrie@zerenity-reiki.co.uk.